LEE, M. , LEE, Y. , YOON, H.
This paper proposes an enhanced rule-based web scanner in order to get better accuracy in detecting web vulnerabilities than the existing tools, which have relatively high false alarm rate when the web pages are installed in unconventional directory paths. Using the proposed matching method based on similarity score, the proposed scheme can determine whether two pages have the same vulnerabilities or not. With this method, the proposed scheme is able to figure out the target web pages are vulnerable by comparing them to the web pages that are known to have vulnerabilities. We show the proposed scanner reduces 12% false alarm rate compared to the existing well-known scanner through the performance evaluation via various experiments. The proposed scheme is especially helpful in detecting vulnerabilities of the web applications which come from well-known open-source web applications after small customization, which happens frequently in many small-sized companies. A. Mockus, R. T. Fielding, and J. Herbsleb, "A Case Study of Open Source Software Development: the Apache Server," Proc. ACM International Conference on Software Engineering, pp. 263-272, 2000. Y. C. Ong, and Z. Ismail. "Recent Advances in Information and Communication Technology", pp. 315-324, Springer International Publishing, 2014. S. Suganya, D. Rajthilak, and G. Gomathi, "Multi-Tier Web Security on Web Applications from Sql Attacks," IOSR Journal of Computer Engineering, vol. 16, no. 2, pp. 1-4, 2014. A. Doupe, M. Cova, and G. Vigna, "Detection of Intrusions and Malware, and Vulnerability Assessment", pp. 111-131, Springer Berlin Heidelberg, 2010. M. Vieira, N. Antunes, and H. Madeira, "Using Web Security Scanners to Detect Vulnerabilities in Web Services," Proc. IEEE/IFIP International Conference on Dependable Systems & Networks, pp. 566-571, 2009. K. Ma, R. Sun, and A. Abraham, "Toward a Lightweight Framework for Monitoring Public Clouds," Proc. Fourth IEEE International Conferences on Computational Aspects of Social Networks. pp. 361-365, 2012. P. Davies, and T. Tryfonas, "A Lightweight Web-based Vulnerability Scanner for Small-scale Computer Network Security Assessment," Journal of Network and Computer Applications, vol. 32, no. 1, pp. 78-95, 2009. G. F. Lyon, "Nmap Network Scanning: The Official Nmap Project Guide to Network Discovery and Security Scanning", pp. 1-20, Insecure Press, 2009. S. Jajodia, S. Noel, and B. O'Berry, "Managing Cyber Threats", pp. 247-266, Springer US, 2005. R. J. Barnett, and B. Irwin, "Towards a Taxonomy of Network Scanning Techniques," Proc. the 2008 ACM annual research conference of the South African Institute of Computer Scientists and Information Technologists on IT research in developing countries: riding the wave of technology, pp. 1-7, 2008. T. Yu, A. Sung, S. Witawas, and G. Rothermel, "An approach to testing commercial embedded systems," Journal of Systems and Software, vo. 88, no. 2, pp. 207-230, 2014. A. A. Alfanookh, "An Automated Universal Server Level Solution for SQL Injection Security Flaw," Proc. International Conference on Electrical, Electronic and Computer Engineering, pp. 131-135, 2004. J. Chang, K. Venkatasubramanian, A. West, and I. Lee, "Analyzing and Defending against Web-based Malware," ACM Computing Surveys, vol. 45, no. 4, article no. 49, 2013. N. Khocharre, S. Chalurkar, and B. Meshram, "Web Application Vulnerabilities Detection Techniques Survey," International Journal of Computer Science & Network Security, vol. 13, no. 6, pp. 71-75, 2013. M. Vieira, N. Antunes, and H. Madeira, "Using Web Security Scanners to Detect Vulnerabilities in Web Services," Proc. IEEE/IFIP Conference on Dependable Systems and Networks, pp. 566-571, Jun. 2009. J. Bau, E. Bursztein, D. Gupta, and J. Mitchell, "State of the Art: Automated Black-Box Web Application Vulnerability Testing," Proc. 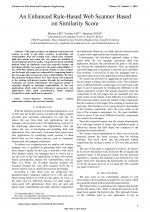 IEEE Symposium on Security and Privacy, pp.332-345, 2010. N. Antunes, and M. Vieira, "Benchmarking Vulnerability Detection Tools for Web Services," Proc. IEEE International Conference on Web Services, pp. 203-210, 2010. Z. Duric, "WAPTT-Web Application Penetration Testing Tool," Advances in Electrical and Computer Engineering, vol. 14, no. 1, pp. 93-102, 2014. Y. Yun, S. Park, Y. Kim, and J. Ryou, "Information Security Practice and Experience", pp 248-259, Springer Berlin Heidelberg, 2006. S. Kals, C. Kruegel, and N. Jovanovic, "SecuBat: A Web Vulnerability Scanner", Proc. the 15th International Conference on World Wide Web, pp. 247-256, 2006. A. Austin, and L. Williams, "One Technique is not Enough: A Comparison of Vulnerability Discovery Techniques," Proc. IEEE International Symposium on Empirical Software Engineering and Measurement (ESEM), pp. 97-106, 2011. V. D. Kotov, and V. I. Vasilyev, "Detection of Web Server Attacks using Principles of Immunocomputing," Proc. 2nd World Congress on Nature and Biologically Inspired Computing, pp. 25- 30, 2010. J. Bau, E. Bursztein, D. Gupta, and J. Mitchell, "State of the art: Automated Black-box Web Application Vulnerability Testing," Proc. IEEE Symposium on Security and Privacy (SP), pp. 332-345, 2010. S. Stefanov, "Building Online Communities with phpBB", pp. 5-15, Packt Publishing, 2005. M. Choi, H. Ju, H. Cha, S. Kim, and J. Hong, "An Efficient Embedded Web Server for Web-based Network Element Management," Proc. IEEE/IFIP Network Operations and Management Symposium, pp. 187-200, 2000. J. Hong, M. Chung, and H. Choo, "Novel Bulletin Board System based on Document Object Model and Client-side Scripting for Improved Interaction," Proc. IEEE International Conferences on Information Networking (ICOIN), pp. 511-516, 2013. A. Blomquist, and M. Arvola, "Personas in Action: Ethnography in an Interaction Design Team," Proc. 2nd ACM Nordic conference on Human-computer interaction, pp. 197-200, 2002. Citations for references updated on 2019-04-22 02:59 in 148 seconds.